Looking to buy a new generator?... Look no further! We stock a large selection of generators ready to be delivered. in some cases, we can offer same day delivery or next day delivery at the latest, We also offer generator hire all over the North West area. This is a great budget generator for daytime use. It is 98d running which means the daytime noise level is suitable for a range of sites and built up areas. It gives out 8.75 KVA of power which in comparison, is enough power to run two cement mixers and many power tools. However, if you require a generator to run into nighttime hours, we also stock super silent generators with 8.75 KVA up to 22KVA. Please call a member of the team to discuss your needs. This Champion Generator benefits from a 15-litre fuel tank this unit can run up to 10 hours at 50% load running on petrol or running off propane 23hrs based on the 19kg bottle (0.84kg/hr based on 50% Load). The OHV engine is equipped with a low oil shut-off sensor and is designed for long life and easy maintenance. This unit is ideal for motorhomes, camping, hunting, travelling, picnics, or for home back-up power during emergencies. With its patented volt guard system installed to protect spikes and surges on appliances and equipment, this makes it an ideal choice. Also included with this model is the patented cold start technology. 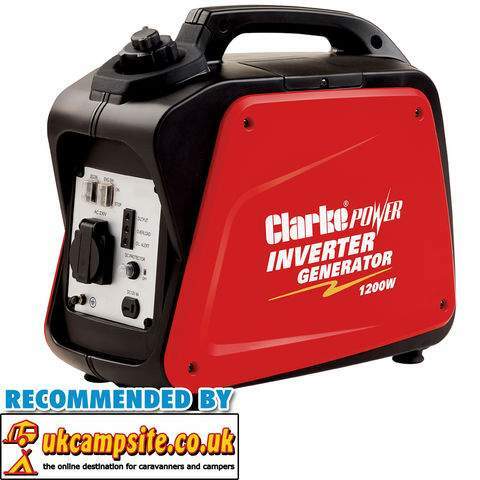 This is a very lightweight and portable generator, ideal for portable power as it gives out 3.5 KVA of power which is more than enough to run a number of power tools or compressor. An extremely affordable diesel generator, which we use and can highly recommend. It is very robust as an on-site electricity source for trade or leisure applications where a reliable source of 110V or 230V power is required. With a maximum output of 5, 000W and the economy of a diesel, it is ideal for builders, remote workshops, leisure events, caravan and camping sites. The automatic voltage regulation (AVR) also allows sensitive electrical equipment to be run such as televisions, laptops, tablets and mobile phone chargers. Along with its powerful 8.8HP engine, large 16-litre tank, it provides 8.5 hours running at ¾ load (approx.) 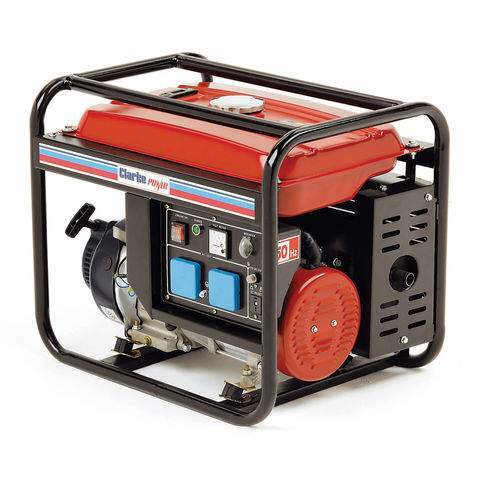 This generator has a quieter operation due to an enclosed structure and an electric key start which provides easy operation and a recoil start for back-up. It features 1 x 230V, 32amp, 1 x 110V, 16amp and 1 x 110V, 32amp sockets. A 12V DC output facility is provided for battery charging such as mobile phones and tablet computers. 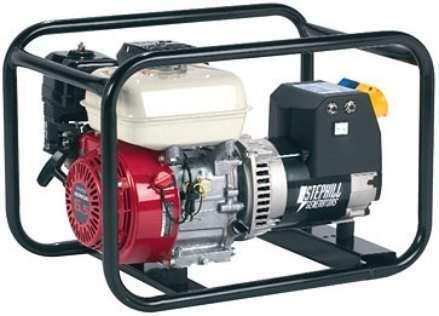 This generator model also offers a low oil pressure alert and automatic cut-off. 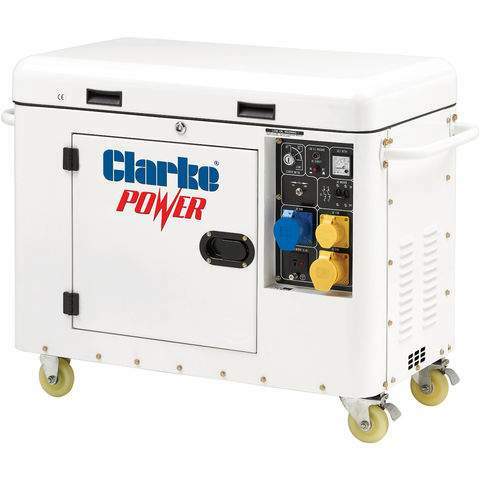 The Clarke IG1200 Inverter Generator is a powerful, lightweight, quiet, portable generator that provides 230V AC power wherever it is needed. The pure sine wave constant voltage technology has a frequency stability of +/-1%, this is more stable than the normal mains supply and is, therefore, ideal for powering sensitive equipment such as computers TVs etc. With a max output of 1200W (1000W continuous), it is perfect for leisure use such as camping, caravanning and much more. It also provides a 12V DC output that can be used for lead-acid battery top-up charging. The IG1200 has an economical air cooled 4 stroke engine and features an Eco-throttle that automatically adjusts the engine speed to match the load for greater fuel efficiency and a lower noise level. An Econ switch also allows the generator to be in idle mode when no power is being drawn, putting a lot less unnecessary strain on the motor and reducing fuel consumption. These features both prolong the lifespan and reduce running costs. The FG3005 provides a highly reliable source of portable electrical power for DIY, leisure and commercial users alike! It delivers up to 2.8kVA of 230V electricity via two 13Amp, 3 pin sockets, and has an additional 12V DC output for battery charging too! Its power comes from a 7HP 4-stroke petrol engine which has both low oil level alert and an easy start recoil mechanism. This generator is built into a sturdy all-steel frame to protect the generators components and to provide easy lifting. We also stock other generators depending on your power needs. We are always happy to advise you on any generator sales enquiries. Please do not hesitate to call us on 07943185471. We regularly stock quality used reconditioned generators including silent generators that have come in on a part exchange basis. There is a quick turnover of these generators due to our competitive prices. Please don't delay in contacting the Fastlane team for current stock and prices. We also repair, restore, service and maintain generators for both trade and public. Please visit our generator repair page for more information or contact a member of the Fastlane team. We have branches all over the North West area. We can deliver your generator to you as a private customer or trade customer to building sites or indeed any location your new generator is needed. We have branches in Stockport, Congleton, Trafford, Manchester, Liverpool, Southport, Runcorn, Atherton, Wirral, Chester, Lymm, Cheshire, Radcliffe, Helsby, Leyland, Oldham, Queensferry, Skelmersdale, Swinton, Trafford, Walkden, Deeside, Denton, Hale, Chorley, Bury, Bolton, Warrington, Wigan and Widnes.